NEWRY -- As his opponents inched closer and closer, Seth Sweet thought of his first Maine Amateur tournament. He was 12 years old when he made his Maine Am debut at Waterville Country Club in 2007. On Thursday, at Sunday River Golf Club, Sweet realized a dream that began that day. 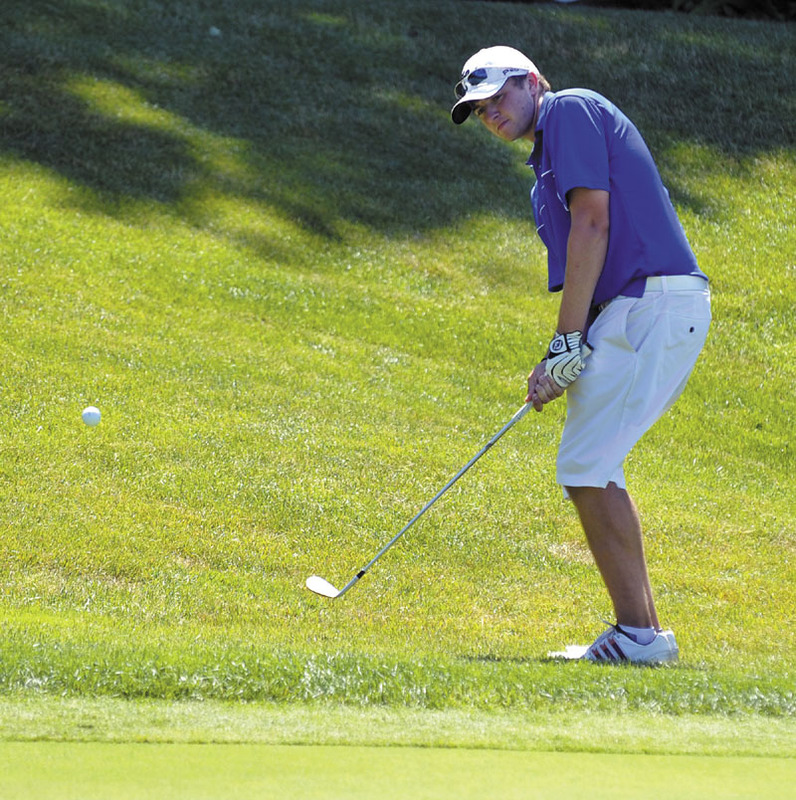 NEWRY — As his opponents inched closer and closer, Seth Sweet thought of his first Maine Amateur tournament. He was 12 years old when he made his Maine Am debut at Waterville Country Club in 2007. On Thursday, at Sunday River Golf Club, Sweet realized a dream that began that day. Sweet, 17, held off impressive rallies by Ricky Jones and J.J. Harris to win the Maine Am for the first time. Photo by Gordon Chibroski / Staff Photographer. Thursday, July 12, 2012. 2012. Seth Sweet chips on the 17th and makes bogey after missing the putt in Maine Amateur Golf action at Sunday River Golf Club in Newry, Maine. Photo by Gordon Chibroski / Staff Photographer. Thursday, July 12, 2012. 2012. 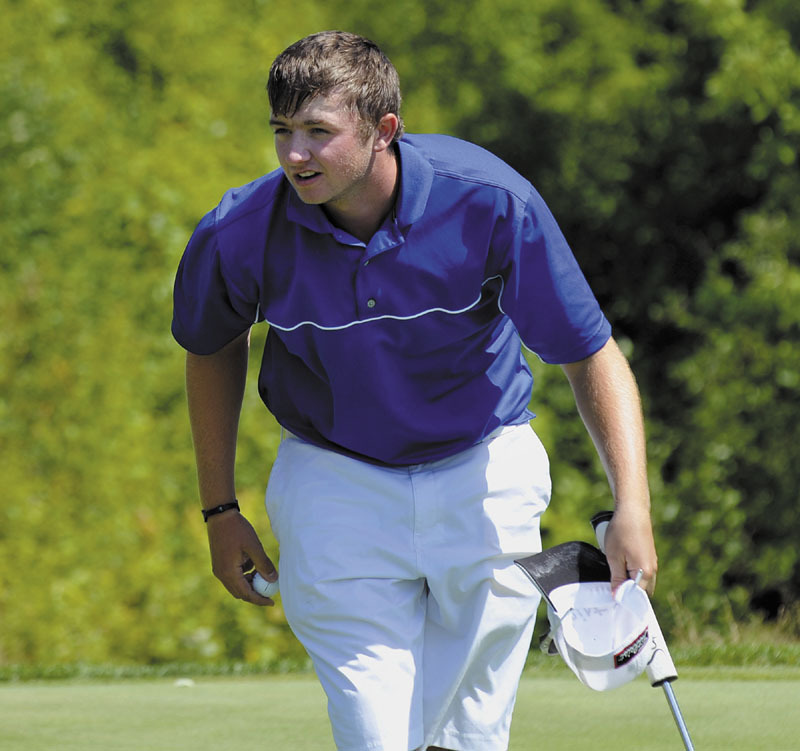 Seth Sweet reacts with contained enthusiasm after parring the 18th and winning the tournament in Maine Amateur Golf action at Sunday River Golf Club in Newry, Maine. Sweet finished with a three-round score of 219, 3-over par. Jones and Harris tied at 222, three shots back. “They each made a heck of a run,” Sweet said. Sweet opened the day with a six-stroke lead over Harris and a nine-stroke lead over Jones. By the 17th tee, that cushion had nearly evaporated. Jones parred the the 163-yard par 3 16th. Sweet’s tee shot went into the bunker to the right of the green, and he double bogeyed the hole. After avoiding double bogeys the first two days, this was Sweet’s second double bogey of the day. The first came on the first hole. Sweet bogeyed 17, and Jones made a short putt for par, cutting Sweet’s lead to two strokes with one hole to play. Harris also bogeyed the hole. Knowing he had a lead to work with, Sweet changed his playing style with six holes left. Harris had a chance to cut Sweet’s lead in half on the first hole, but missed a short birdie putt and settled for par. On the ninth hole, after Sweet sank an eight foot putt to save par, Harris’ par try went off the lip of the cup. After sinking a four-foot putt on 18 for par, Sweet celebrated modestly by hugging his parents. The outward reaction was not an indication of Sweet’s enthusiasm. “Anything higher is probably the Master’s or the U.S. Open. It’s pretty important to me,” Sweet said.